Blake and I love how much we can use technology to communicate and stay in touch with our families, even though we're spread all over the country. We're big fans of texting, calling, Skype, and FaceTime. We have set up private Facebook groups for each side of our family for even more communication options. Another favorite things of ours is playing games online. Online games are really nothing new, but we've found a couple we particularly enjoy. 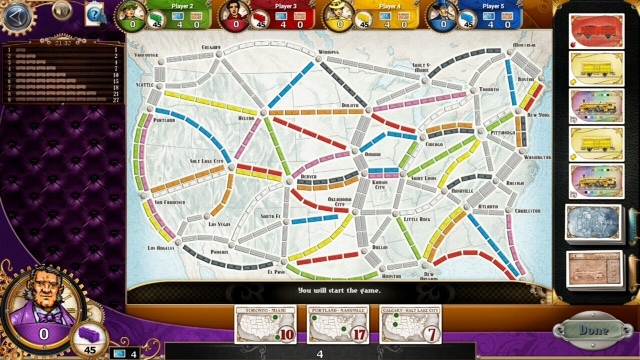 Our competitive game of choice is Ticket to Ride. We can set up a private table on Steam and up to five can play at a time. When I was in Utah in September, we played with most of my family. Blake played on his phone in Virginia. I was on my computer in Utah. My parents were a team on Dad's iPad. Mr. and Mrs. Brotherface were a team on Mom's desktop. Sadly, Mr. and Mrs. Sisterpants weren't able to join us that time, but we've played with them since. Since we had Blake on Skype on my dad's laptop, it was more like we were all together physically. Now that we've shown my side of the family how to play online, we're hoping to do it more often. We often get to play with Blake's brother and sister-in-law, and those games can get mean. We played two rounds last Saturday and I won the first one. Blake, very kindly, helped me find an alternate route when my plan A failed and I paid him back by winning by one point because of the Longest Train card. He had been up by 9 until the last second. Sorry, sweetie! I came in third on the second game because a certain brother-in-law purposefully disrupted my route just because he could and I never fully recovered. Fortunately, he came in 4th, which was my only consolation. 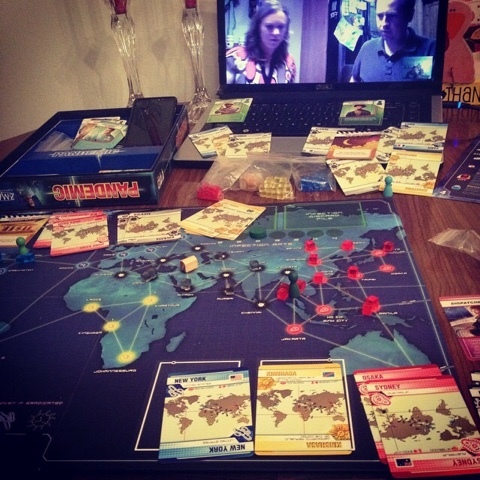 Cooperatively, we like playing Pandemic via Skype. Each side sets up a board, so you do have to have an actual copy of the game to be most effective. One side runs the master board and the other follows it so everyone can still see what's going on and still work together. We've lost more than we've won, but it's still fun to play together. We'd love to see how other cooperative games like Forbidden Island or Forbidden Desert work on Skype sometime. Cooperative games work well because you don't have to hide anything from the other players, so you can be fully transparent will running the two boards simultaneously. If you're non-local and want to try one of these games with us, just let us know! 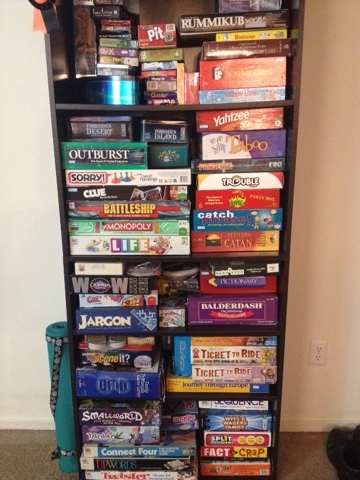 If you are local, we'd love to set up an in person game time. We have a lot more options than just those two . . .
What are your favorite ways to keep in touch with your families and friends? We use Skype to do story/song time with grandparents twice a week. Iddo learned the English alphabet song solely from listening to her Grandma Dennis sing it to her while she ate dinner every Tuesday because we only sing the Hebrew alphabet song at home. I love hearing Iddo recite lines from the books that Grandpa and Grandma Giles read to her. My sister and I turn on Skype once a week and talk while our kids play in the background and say hi to each other. Just because they are a full days drive apart and are in each other's company less than once a year doesn't mean the cousins can't know each other.